Homeowners across the country are taking advantage of the strong housing market and selling their home while it’s still an easy process! Even with the housing market in such a great place, the moving process is still an extremely stressful process. By being prepared, you’ll be able to eliminate some of the stress from packing, moving, and unpacking. Regardless of whether you’re downsizing or moving into a larger space, take advantage of these tips to make the process a little bit easier. The most time-consuming part of moving is physically moving your belongings from point A to point B. A moving company will be able to operate efficiently so you can focus on last minute details and avoid having to ask your friends and family members to help you. The first thing you’re going to notice when you’re packing up all of your things is how much stuff you actually have. 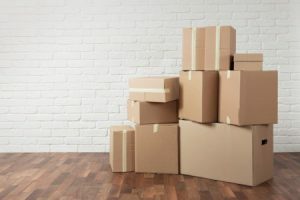 Use the moving process as an opportunity to purge your attic, basement, and garage of all of the things you no longer need. Once you’ve gone through everything, give our junk removal team a call to schedule an appointment to ensure all of your belongings are disposed of through the proper channels. Don’t wait until the last minute to start packing and cleaning up your house. Be sure to make arrangements early and avoid procrastinating at all costs! This will alleviate any unnecessary stress. Two Weeks Out: Purchase any moving supplies you will need, including packing tape, boxes, bubble wrap, scissors, markers, and moving blankets. Confirm the pickup time with your moving company and start the packing process. One Week Out: Finish packing up your home, but leave any items you’ll need over the next week unpacked or in open boxes for easy access. Eat what you have in the fridge and avoid any big grocery trips. Take out is your new best friend! Day Before: Put all of the remaining items into their designated box and tape it shut. Leave out a change of clothes and any items you need for the last day out in a plastic container that you can put a lid on and throw in the car on your way out. Opt for takeout for dinner to avoid cleaning any dishes, do a walk-through of your home, and clean the space for the new owners. Morning Of: Wake up early, pick up breakfast and coffee, and grab some extra water bottles for your family. While the movers are packing up the truck, do a final walk-through of your home to make sure you don’t forget anything. To schedule your moving services with All Day Moving, give us a call today at (978) 682-2040.